Oran Kearney admitted he was frustrated his Coleraine side didn’t kill off Glenavon when they had the chance on Saturday. The Bannsiders had several opportunities to secure the points against the Lurgan Blues after Darren McCauley’s 70th minute opener. But in the end they were undone by a last minute equaliser by James Singleton. It could have been worse though but for a wonder save by Chris Johns from Rhys Marshall with the last kick of the game. “It was a bit frustrating we didn’t kill the game off,” he told Times Sport. “We had a great opportunity to do that when we had four on one, but we were reckless in the way we went about it. “We had a couple of other chances too were if we had been ruthless we could have put the game to bed. “It was another great goal by Darren, and a super ball in by Ian Parkhill, he put it right on the money for him. “Darren is a fantastic player, he has had a great season and now he’s weighing in with the goals. “Glenavon are a dangerous side with some very good players as we well know. “We failed to look after the ball from a free kick up in their corner just before their goal. “We should have been looking after the ball and keeping possession, but we lost it and they break the length of the pitch and score. It was a valuable point in the end as Cliftonville were beaten at home to Crusaders, so Oran Kearney’s men extended their lead to six points over the Reds with three games to play. “If that had been the third game of the season with not as much at stake it would have probably have felt more like a defeat than a draw,” said Kearney. “But as we saw last week we know it’s a different kettle of fish at this stage of the season, we know the games are going to take their form and today was no different. 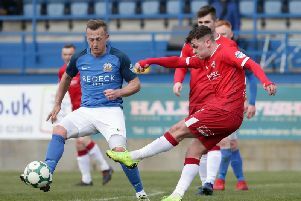 Glenavon boss Gary Hamilton was also left frustrated by his side at the end as he felt their finishing cost them all three points. “Another draw for us this season, I think that’s 13 for us now in the league, that’s the reason why we are sitting where we are,” he said. “We haven’t been able to find a solution to that, and today was the same. “Between bad misses, a couple of great saves from their keeper and a couple of good blocks from their defenders, that’s been the difference between us winning and drawing.